The dirty dishes cake was covered in fondant and the decorations were sculpted out of gumpaste. 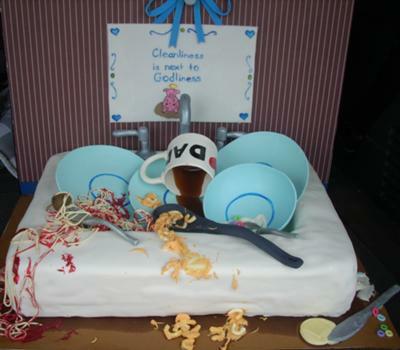 The recipient of this cake is a clean freak. THAT IS THE PERFECT CAKE FOR A NEAT FREAK. MY SISTER WOULD HAVE LOVED IT. SHE WAS A NEAT FREAK. I THINK THAT WAS SO COOL AND WHAT A DIFFERENT IDEA. NANCY OF CA GOOD JOB!! !